Taijul - the new hero! 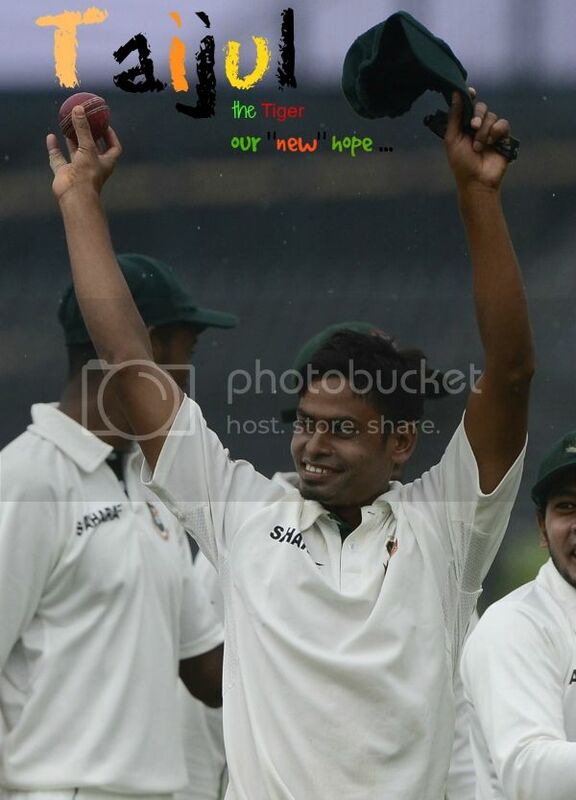 Taijul seems going to be our new sensation ... can he be a world class spinner? Does BCB has a plan to grow him further? Or, he might become another Gazi or Sunny, who gets almost no support from BCB & Co.? Last edited by kalpurush; December 1, 2014 at 06:04 PM..
lol please...leftie crafty aint nothing special. Too early to predict anything. Is he a good Turner of a cricket ball? Selectors think he is more different than other SLA's-in the sense he gives the ball more air. Newage article he states he tries to focus on the right spot. Taijul must take a lesson from all the SLA's-Enamul, Arafat, Elias. A good SLA must be able to strike the right balance between attacking and defensive bowling. Shakib for instance was at his best when he was willing to give air, and attack. But at the same time he always bowled in the right areas, never gave anything loose. Rafique was another example. Plenty of loop and accuracy. And these two also were thinking bowlers. Cant say the same about other SLA's. Even Sohag Gazi seems to have gone astray. That's what's key about Rafique and Shakib. They have a plan B if something doesn't work. Having so many SLAs could've been a good thing if they were actually good but the problem is they aren't very good. Most of them just look to contain rather than attack. Then they go play at the international level and get smashed because they even lack discipline. Not many SLA's get smashed in International level as per my humble observation. It was always the other bowlers be it an offie, a part-timer, the pacer who would succumb the flood of runs to deliver worse as the game progresses. In most cases the rare wickets we might get comes from the spinner, more appropriately the SLA in the team. If he can loop of and keep it tight that's all we can ask for at this stage..just no freebies every over..razzak, sunny, enam and most of the others are prone to going for runs after all these years and lack venom. He has to try and learn the importance of maidens..
Lol. Thats the thing. Watching IPL there are so many leg spinners in India. We could do with just one! not a leggie, not an offie, not even a medium pacer or anything but a SLA..another sla...woopty fing doo! Gazi needs spoon feeding. He was doing better with Saqlain around. Someone needs to tell him what he needs to do. Taijul is definitely special. Maybe the batsmen got out playing too many shots, but then again others bowlers could not take advantage of it really, right? So I think Taijul is better than the most, at least at our First Class level. What will happen at the international level time will tell, but so far it seems he might perform better than some of the regulars..
As I said in another thread, Imrul taking Taijul to cleaners shows he still have a lot to learn. He has to develop tricks to get batsmen out when they come after him, especially when they jump down the crease to attack him. I am assuming he has not yet developed a good arm ball. That will probably be the hardest opponent for a spinner to debut in. I will let him develop in the A team tour and if he does well he can come into the senior side later this year. The Indians will chew him and spit it out. at least we'll get to say that indians couldn't eat taijul alive! Thats true. One bad tour can dent his confidence. can Taijul save us from Abdur Razzaq? or the clueless Gazi ? absolutely...but after a year or 2 who's gona save us from taijul?? hehe, we will find another player by then.